This is a very random post - all in a weekend. Just a short post, don't worry. Here was what I did. 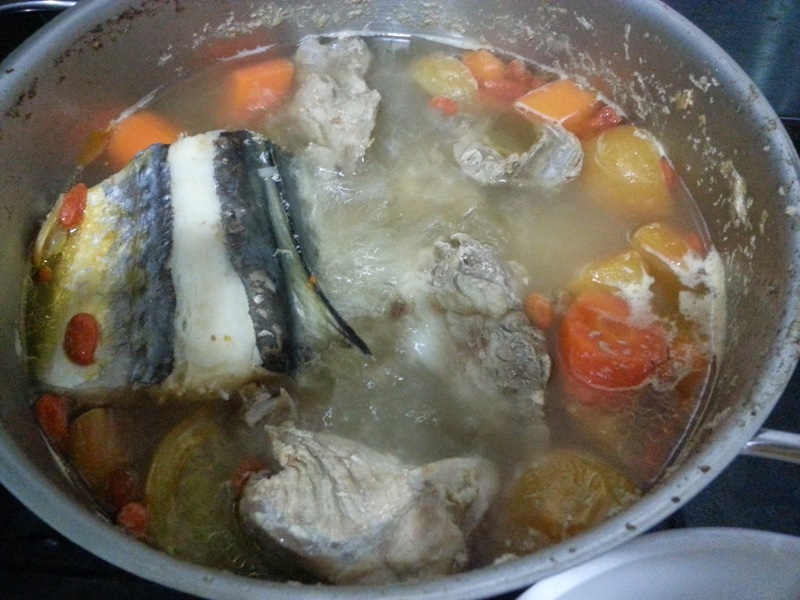 Boiled soup on Friday night, after work - Fish+pork+carrot+tomato+wolfberries. Prepared a not-so-healthy breakfast for Kz on Saturday morning. Every mommy needs some sanity (I'm talking about me), and kids not eating healthily once a while is alright, I reckon. After the kids nap, I steamed some dark chocolate cupcakes. I don't know if it was uncooked or what, but it has "lava" coming out in the middle, it didn't taste "raw" and it was so nice, and I finished all 3! None for the boys. Went to the mini petting zoo on Sunday. The kids had fun with the ducks, fishes, rabbits. G is turning 2 in April. Means I'm getting older. No more looking like an "under-aged" mum, like Claire used to say, teehee. Haha, I'm laughing la.. I thought you wanted to say I cheated about forcing them to eat healthily and then serve them deli-meat (hotdogs) and packet cookies for breakfast, hehe.. Morning Sharon.. I'm hogging the pc coz I have a meeting at 10am.. Wana reply all comments before I go inside the meeting ma.. Oh yes, the kids love the petting zoo too, but I didn't really like it, makes me sweaty, hehe..
fish and pork soup...never tried "kahwin" before these two meat. taste good? I had the same question as Meow when I was reading it. Guess my question answered. 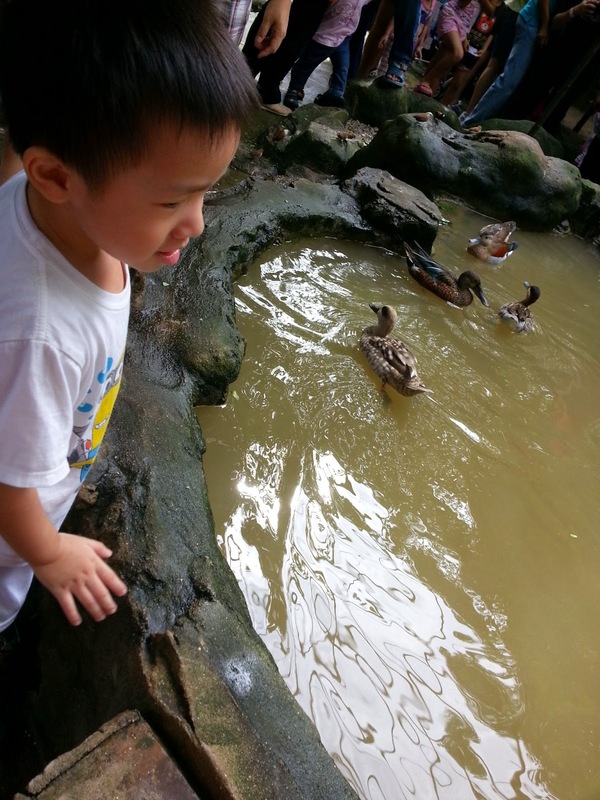 Great idea for the kids to be familiar with animals, esp ducks. City folks don't see live ducks anymore. Ooh, choco-lava oozing out sounds like yum! mini zoo where? the one in seri kembangan? Yep, the same one, Farm In The City..
Wow... so nice ! Cook and bake nice food for the kids and later bring them to zoo. You should get close to nature more ...helps you to wind down. I didn't really like that petting zoo.. Hot and makes me sweaty leh..
Yeah, whenever my activities are fruitful ahh, I sure blog about it.. if just stay at home and boil ABC soup, then I'd be very quiet.. That's my pattern la.. I am drafting my random post too, keke! I seldom do random post, but lately, macam nothing much to blog about.. My life's boring, I stay at home most of the time, boiling ABC soup... Really..
Hi Louiz! I was laughing when I read about the part where you sapu all the cupcakes. 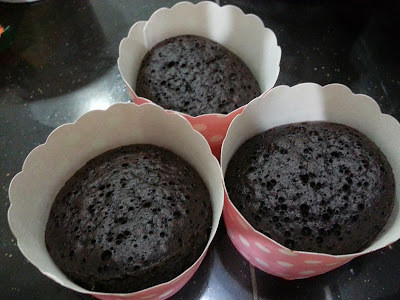 I actually prefer my choc cupcakes slightly underdone so that the middle part is gooey and chocolaty. Sedap lor! Really, initially, I wanted to give one to Kz, but I finished all the 3! 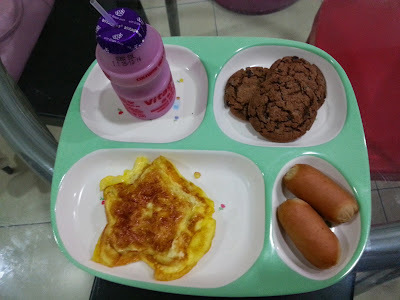 Not self praising, but it was very good, I adapted from your steamed chocolate cake, but ingredients all divided until it reaches 1 egg, teehee..
u r such a great mummy...u boiled homely soup for the family, prepares 'cute & yummy' breakfast for the kids and brings them to zoo! i jealous of ur kids to have a wondermum! I do have my temper most of the time, and I always always give them my killer stare.. They make my blood boil most of the time, but when I think back how badly I wanted to conceive, and how difficult for me to conceive them, I keep back my temper lor and control myself..
My kids mostly eat unhealthy food. Lol. If I cook healthy food they hardly eat. Hehe. errr, your random post not very random also lah, still surrounding your kids only mah.. not like my post, really random and can have any topic one lor, haha.. like that i can find things to write more easily leh, "sky south earth north" mah, if ask me to give my blog one very specific theme then i also dunno what else to write already.. like those food blog, parenting blog, baking blog, travel blog - wow, salute they can update everyday with new posts!! or perhaps setting a theme is more easy leh?? like you already have one direction then you just write about the topic only.. unlike me, everytime need to think of what to write, and i hope not to repeat the same thing over and over again.. more susah hor?? Yeah wor, I think yours lagi susah, coz need to always think of new stuffs to write hor.. Me leh, errr, come come go go same thing lor - parenting, baking, cooking, office politics.. Hmm, long time no "radio deejay" post jor hor.. Haha..
Now hardly eat out. Either I cook or go to my parents' house for dinner. Cannot take 3 kids out by myself. Tough! Yeah, agree, I'm not a health-freak mummy la, I have to admit sometimes I'm too cincai in feeding the kids.. They eat what I eat - with salt, sugar and soya sauce, really.. I really salute those mummies who insist to cook 100% for the kids even though they are eating out.. They will be bringing containers with soup, porridge, fruits and cereals, while the adults having kai si hor fun and ckt !! wah, so nice ah? go to mini zoo woh.. was that the same mini zoo that you went some months ago ah?? i remember you posted something similar woh, got tortoise and what-nots one woh.. but then just stayed there for 45 minutes or so and had to go home.. so this time round you actually enjoyed a longer stay there?? the kids looking at the little animals so concentratedly, putting on a smile on their faces, guess they like the place very much hor?? 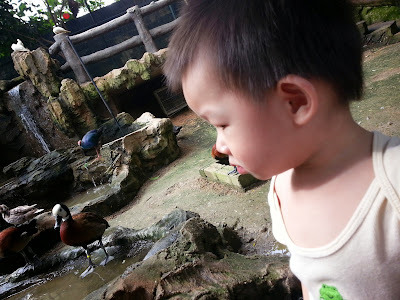 Mini petting zoo lor.. No elephants, no tigers, no giraffes, only fishes, ducks and rabbits only.. Errr, I dunno how to "yan seong" one la, makes me sweaty leh.. The breakfast for the boys look ok to me. Got unhealthy meh? No junk food there also. Hotdogs not healthy ma, hehe.. Frozen hotdogs from the packet, I just steamed it back.. Your soup is so nutritious, got pork and also fish. Must be very sweet from all the good ingredients. Oh yeah, the fish was already in the freezer for 3 weeks.. So I just chuck it into the soup lor..
You are still young. When your boys are 20 years old, you are only 40++ only. Let me see, when Kz is 20, I would be late 40's..
That's what some people tell me chocolate lava cake is - under-cooked chocolate cake...so the inside is still soft and will flow out when cut but if you watch the movie, Chef, the guy said it wasn't, not so simple, something else...when he was scolding the blogger who gave him a bad review. Yep, the inside was still soft, but the "lava" didn't taste raw, I tried to steam it longer, but the middle part still remained uncooked.. I gave up, and just scooped with a spoon to eat.. One lead to another, and I finished everything..Haha..
Did you use star shape thing to cook the egg?? Yeah, I used a star-shaped pan to fry the egg, my sister gave it to me, but it was relaly hard to cook with such a small pan.. The pan is as big as your palm only..
u wolfed down all three choc cupcakes? Niceeeee!! lol Have a good week! You finished the cakes and left nothing for your boys??? Sometimes, I do the same thing too... Ops! LOL! Yeah, I didn't save it for the boys, I thought it was uncooked, but actually it tasted very nice.. So I finished everything, yummmzzz..
Oh yes, you are right, til today, I love eggs and sausages, I treat it as a luxury la, else, it's just Quaker oats and condensed milk for breakfast..
Condensed milk? It's sooooo hard to find now and it's so expensive (RM 20++ per can) when you find it in import groceries too. It seems like everything is creamers now since the 1997 stock market crash - found one just now but at RM 24, I can't afford it anymore. Yep, I ate all 3, not self-praising, but it tasted so good leh..
Wow! The soup definitely looks great!! I'm curious as to how you could eat the cupcakes all by yourself. Haha!! Lovely post btw!! Hello Jason, nice to meet you.. The soup taste good.. It has fish, pork, tomatoes, carrots and wolfberries in it.. I boil soup once a week, normally on Thursday night, and store them into jars.. I need to use the soup to make noodles for the kids on weekends..